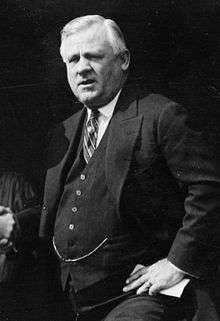 John Joseph McGraw (April 7, 1873 – February 25, 1934), nicknamed "Little Napoleon" and "Mugsy", was a Major League Baseball (MLB) player and long-time manager of the New York Giants. He was elected to the Baseball Hall of Fame in 1937. While primarily a third baseman throughout his career, he also played shortstop and the outfield in the major leagues. Much lauded as a player, McGraw was one of the standard-bearers of dead-ball era baseball. Known for his quick temper but also being a great baseball mind, scientifically as well as in bending the playing rules, especially in the days of less than four umpires, McGraw was a key player on the pennant-winning 1890s Baltimore Orioles, and later applied his talents and temper while a captain (playing)-manager, transitioning in 1902 to the New York Giants, with whom he became entirely a bench manager in 1907 until his retirement in 1932. Even with his success and notoriety as a player, he is best known for his managing, especially since it was with a team so popular as the New York Giants. His total of 2,763 victories in that capacity ranks second overall behind only Connie Mack; he still holds the National League record with 2,669 wins in the senior circuit. McGraw is widely held to be "the best player to become a great manager" in the history of baseball. McGraw also held the MLB record for most ejections by a manager (132) until Bobby Cox broke the record in 2007. McGraw's father, whose name was also John, and his older brother Michael immigrated from Ireland in 1856. Their last name is spelled "McGrath" but pronounced McGraw. He and his brother had arrived in time for the Civil War, and were drawn into the conflict as part of the Union army. Shortly after the war, he married and McGraw's older half-sister was born. John McGraw, Sr.'s first wife died, and he began moving around looking for work—a search that ultimately led him to Truxton, New York, in 1871. It was there that the elder John McGraw married young Ellen Comerfort. They had the younger John McGraw on April 7, 1873. Tragedy struck the family in the summer of 1883, when a debilitating fever swept through the family. Johnny's half-sister Annie, 13, was the first to succumb, and his mother died shortly thereafter. By the time September 1883 had passed, three more McGraw children had died. The devastated family moved from their house in the country into a hotel in town. Johnny's father, understandably bitter, heaped even more responsibility on the young boy's shoulders, and had very little patience for his son's passion for baseball. He became abusive toward the boy, and later on in 1885 (still only 12 years old), Johnny ran away. From that day onward, he was raised by a kindly neighbor, Mary Goddard, under whose care he did quite well. During his years as part of Goddard's household, he took on several jobs that allowed him to save money to buy baseballs and the Spalding magazines that chronicled the rules changes in the rival major leagues of baseball, the National League and the American Association. He quickly became the best player on his school team. Shortly after his 16th birthday, he began playing for his town's team, the Truxton Grays, making a favorable impression on their manager, Albert "Bert" Kenney. While he could play any position, his ability to throw a big curveball made him the star pitcher. McGraw's relationship with Kenney precipitated his professional playing career. After that first season, McGraw caught on with the traveling team of flamboyant promoter and fellow player, Al Lawson. Then only 21 himself, Lawson had gathered a ragtag group of players. 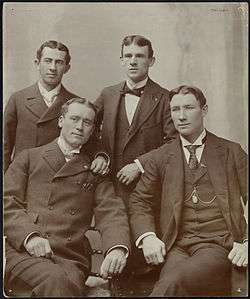 These he took to Gainesville, Florida, in February 1891, hoping to play against major league teams who were training in the area. After defeating a team from Ocala a couple of times, Lawson began calling his team "the champions of Florida", and was able to convince the major league team from Cleveland to play against his team. It was during this game that McGraw gained his first notoriety as a player. The Cleveland squad was led by Denton True "Cy" Young, who had already become famous for his "cyclone"-like fastball. Lawson acted as the boy's agent and advised him to request $125 monthly and a $75 advance. The manager of the Cedar Rapids club in the Illinois–Iowa League was the first to wire the money and McGraw decided to make that his next stop. It was later claimed by several other clubs that McGraw had signed with them and had accepted their $75 advances. Though they threatened to sue, the clubs were never able to substantiate these claims and McGraw was allowed to play in the league. McGraw's playing career in the 1890s was a focus of a 2004 book featuring Baltimore's tricky and dirty play and what might be called the players’ "anti-social" behavior during that decade – and, for sake of comparison, that book also chronicled and quantified the tricky and dirty play of the Chicago National League team from 1879 to 1897, under Cap Anson, its longtime captain-manager. The final chapter of that book, which is part of a series that methodically plowed through 19th-century baseball reporting, states, "On one hand, Baltimore seems to have been more entertaining than Chicago for a more compact period, especially because of the notoriety of John McGraw and wild stories of trickery that have been passed down. On the other, Chicago is more significant over the long haul, to show the game's progression from the 1870s to 1900. Where Baltimore is considered most significant is for its successful execution of baseball strategy in the 1890s, such as bunting, sacrificing and using the hit and run." Baltimore's play "included a mix of the perfectly ethical, like the hit and run, with tactics considered more dubious, such as excessive arguing with the umpire", to try to intimidate, which was a McGraw specialty. Contrary to now-deleted Wikipedia prose that claimed that McGraw was "notorious for tripping, blocking and impeding a baserunner in any way he could while the umpire was distracted by the flight of the ball. His profligacy in employing such tactics may have led to additional umpires being assigned to monitor the basepaths", only 4 of the 23 plays involved McGraw blocking runners; most were when he was running the bases. To show how overblown the notion that McGraw blocked many runners is, at least overtly, after seeing the 5’7", 155-pound McGraw try to block Cleveland's Buck Ewing from third base, and Ewing "went into him with such force that he knocked McGraw off his feet", John B. Foster of the Cleveland Leader wrote, "McGraw is rather a light youngster to be so anxious to block men off the bases. Another year in the league is likely to teach him a sorry lesson." That said, the 2004 book opined that at third base, McGraw "probably sometimes stood slightly in the path that runners wanted to take", to make it less likely they would score a run. The book cites a 1948 statement by former Baltimore teammate Sadie McMahon that said, "McGraw wouldn't give the bag to the base runner like they do today" and also that he would "stand on the inside corner and make the runner go around." However, the 2004 book also noted that in the 1890s, "some third basemen were well known for being tricky, including McGraw, Patsy Tebeau and Bill Joyce. Yet I [the author] found no reports of them doing "unobtrusive" blocking. There are reports of either overt blocking or nothing." In his 1998 The League That Failed, David Voigt said McGraw believed that "only by mastering the rules could he circumvent them." So "he became a master at finding loopholes." The 2004 book found that observation fair, especially in the way he fouled off pitches to draw walks or tire the pitcher. Voigt added, "Among tactics used by McGraw was the opportunistic base runner's trick of slapping a ball from an infielder's grasp, the psychological ploy of wearing wickedly sharpened spikes, and vocally abusing opposing players and umpires." The 2004 book concluded that of those tactics, "only vocal abuse seems to have been central to McGraw's style." 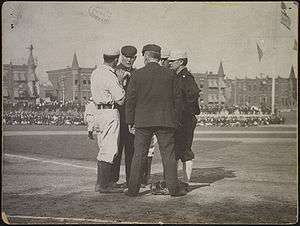 Voigt also wrote that McGraw had a reputation as a "dirty player" as of 1895 that was "the talk of the league." The 2004 book states, "It depends how you define ‘dirty.’ Voigt seems to mean playing dirty by the way he uses it, while newspapers hardly portrayed McGraw that way. By 1895, some were singling out McGraw for his mouth." The 2004 author stated, "In many newspapers of the 1890s, I found no generalizations about [McGraw's] dirty play. In 1899, the Pittsburg Leader said the following after he was "as quiet as a lamb" one day at Pittsburgh: "McGraw, although having the reputation of being a rowdy ball player, has never shown any rowdy tactics in this city." The 2004 book also took issue with Noel Hynd's 1996 The Giants of the Polo Grounds, which has a "dirty-tricks-combined-with-flashing-spikes" reference to the Orioles. It concludes that "a more apt description of the 1890s Baltimore team would be ‘flying mouths.'" McGraw figures prominently in an Orioles-spiked-umpires recollection in Fred Lieb's 1950 The Baseball Story, which quotes 1890s umpire John Heydler, later a National League president, as saying: "We hear much of the glories and durability of the old Orioles, but the truth about this team seldom has been told. They were mean, vicious, ready at any time to maim a rival player or an umpire, if it helped their cause. The things they would say to an umpire were unbelievably vile, and they broke the spirits of some fine men. I’ve seen umpires bathe their feet by the hour after McGraw and others spiked them through their shoes. The club never was a constructive force in the game. The worst of it was they got by with much of their browbeating and hooliganism. Other clubs patterned after them, and I feel the lot of the umpire never was worse than in the years when the Orioles were flying high." As far as Heydler's accusation about having been spiked, the 2004 book concludes, "contemporaneous reporting does not validate it. Perhaps coincidentally, a reference to Heydler in 1898 did include a reference to spiking. Ren Mulford Jr. of the Cincinnati Post wrote, ‘Umpire John Heydler's backbone is said to be badly in need of stiffening. He is foolish if he permits any diamond gentleman to wipe their spiked shoes on him this year.’" The 2004 book added, "Mulford wrote colorfully, and letting players wipe their spiked shoes was figurative for letting them argue at will." Over 33 years as a manager with the Baltimore Orioles of both leagues (1899 NL, 1901–1902 AL) and New York Giants (1902–1932), McGraw compiled 2,763 wins and 1,948 losses for a .586 winning percentage. His teams won 10 National League pennants, three World Series championships and had 11 second-place finishes while posting only two losing records. In 1918 he broke Fred Clarke's major league record of 1,670 career victories; he was later passed by Mack. McGraw led the Giants to first place each year from 1921 to 1924, becoming the only National League manager to win four consecutive pennants. At the time of his retirement, McGraw had been ejected from games 131 times (at least 14 of these came as a player). This record would stand until Atlanta Braves manager Bobby Cox broke it on August 14, 2007. McGraw married Minnie Doyle, the daughter of prominent Baltimore politician Michael Doyle, on February 3, 1897. This was at the height of his fame as a player for the old Baltimore Orioles of the National League. Two years later, while McGraw was on a road trip with his team, she developed appendicitis. An emergency appendectomy was performed, and McGraw was called back from Louisville, Kentucky. Her condition worsened and, surrounded by McGraw and other members of the family, Minnie died on September 1, 1899 at the age of 23. He married his second wife, Blanche Sindall, on January 8, 1902. She outlived McGraw by nearly 30 years, dying on November 4, 1962. Even after her husband's death, Mrs. McGraw was a devoted fan of the team he had managed for so long. In 1951, she threw out the first pitch during a World Series game in which her beloved Giants played the New York Yankees. The Yankees won that day, 6–2, and went on to win the championship—their third in a row—in six games. While owners of a bowling, billiards and pool hall in Baltimore, McGraw and Wilbert Robinson introduced the sport of duckpin bowling within the city of Baltimore in 1899. Connie Mack would surpass McGraw's major league victory total just months later. After his death McGraw's wife found, among his personal belongings, a list of all the black players he wanted to sign over the years. ↑ "Manager records index". Baseball-Reference.com. Retrieved 2008-05-03. 1 2 Alexander, Charles (1995). John McGraw. Lincoln: University of Nebraska Press. ISBN 0-8032-5925-5. ↑ Charles Alexander 1995, pp. 22. ↑ Donovan, Henry. "Chicago Eagle". Illinois Digital Newspaper Collections. Retrieved 26 June 2015. ↑ Graham, Frank (2007). Mcgraw of the Giants – an Informal Biography. City: Chauhau Press. ISBN 1-4067-3462-4. ↑ Rosenberg, Howard W. (2005). 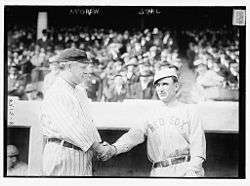 Cap Anson 3: Muggsy John McGraw and the Tricksters: Baseball's Fun Age of Rule Bending. Tile Books. p. 472. ISBN 0-9725574-2-3. , p. 342. ↑ Rosenberg. Cap Anson 3. , p. 245. ↑ Rosenberg. Cap Anson 3. , p. 61. ↑ Rosenberg. Cap Anson 3. , p. 82, citing, in part, the Cleveland Leader, September 15, 1893. ↑ Rosenberg. Cap Anson 3. , pp. 47-48, citing, in part, the Baltimore Sun, July 11, 1948. ↑ Rosenberg. Cap Anson 3. , p. 50. ↑ Rosenberg. Cap Anson 3. , p.233, citing David Quentin Voigt, The League That Failed (Lanham, Maryland: Scarecrow, 1998), 61. ↑ Rosenberg. Cap Anson 3. , p. 233, citing, in part, Voigt, The League That Failed (1998), 61. ↑ Rosenberg. Cap Anson 3. , pp. 233-234, citing, in part, Voigt, The League That Failed (1998), 61. ↑ Rosenberg, Howard W. Cap Anson 3. , p. 234, citing, in part, Pittsburg Leader and Pittsburgh Commercial Gazette, May 23, 1899. ↑ Rosenberg. Cap Anson 3. , p. 206, citing, in part, Noel Hynd, The Giants of the Polo Grounds (Dallas: Taylor, 1996), 84. ↑ Rosenberg. Cap Anson 3. , p. 217, citing, in part, Frederick G. Lieb, The Baseball Story (New York: G.P. Putnam's Sons, 1950), 141. ↑ Rosenberg. Cap Anson 3. , p. 220, citing, in part, Cincinnati Post, May 3, 1898. More analysis from the 2004 author about tricky and dirty play by the 1890s Orioles as a whole appears under Wikipedia's Baltimore Orioles (19th century) entry. 1 2 Deford, Frank (2006). The Old Ball Game. New York: Grove Press. ISBN 0-8021-4247-8. ↑ Morris, Peter (2006). A Game of Inches: The Game on the Field. Ivan R. Dee. p. 318. ISBN 1-56663-677-9. ↑ McNeil, William (2006). The Evolution of Pitching in Major League Baseball. McFarland & Company. p. 53. ISBN 9780786424689. Retrieved January 19, 2012. ↑ James, Bill (1997). The Bill James Guide to Baseball Managers. Diversion Books. 1 2 Mcgraw, John (1995). My Thirty Years in Baseball. Lincoln: University of Nebraska Press. ISBN 0-8032-8139-0. ↑ "Manager McGraw's Wife Dead" (PDF). The New York Times. 1899-09-01. Retrieved 2008-07-28. ↑ "Mrs. John J. McGraw, 81, Dies". The New York Times. 1962-11-05. Retrieved 2008-07-28. ↑ "Mrs. John McGraw, Wife Of Former Giant Manager, Tossed Out First Ball", by Whitney Martin, for The Hartford Courant, 6 October 1951. ↑ "John McGraw Long Baseball Leader Dies", The Hartford Courant, 26 February 1934. ↑ Threston (2003). The Integration of Baseball in Philadelphia. p. 11. "Profiles: Mister Muggsy". The New Yorker. 1 (6): 9–10. 28 March 1925.